The Ground-Guards sales team were asked on several occasions to provide a ground protection system that would take very heavy plant and machinery across unusually wet, boggy and unstable ground conditions. In extremely wet conditions a mat with flotation properties is needed; this stops the mat from sinking through the mud. 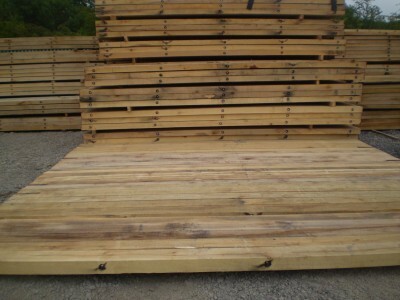 Seeking to support our clients as much as possible we have now added timber BogMats to the hire fleet in November 2013. BogMats range in size from 3m – 5m wide and from 70mm – 200mm thick. All BogMats are made from sustainably sourced hardwood; either European Oak or Tropical Hardwood. The Ground-Guards BogMats can be installed either using Hiab, Telehandler, or excavator. Stay in touch – there are more new products on the way!